Learn more about the life of Jester Hairston, who was born at Belews Creek. 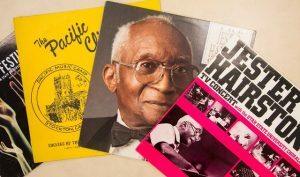 He brought his grandparents’ spirituals to the world stage, elevating the music from Stokes County for all to hear. The film screening will begin at 2 pm on Sunday, January 14th, 2018 at The Arts Place of Stokes, 502 N. Main St., Danbury, NC. Screening will be followed by an informal panel of community members, who are invited to share their personal stories about Jester Hairston. Princess Hairston, NYC filmmaker, will share a clip from her upcoming full-length documentary, Tracing the Hairstons, which includes local community members. Participate in a collaborative hands-on art activity and learn more information about The Lilies Project. Kickoff at the Walnut Cove Public Library on Saturday, January 13th from 10 am – 12:30 pm.